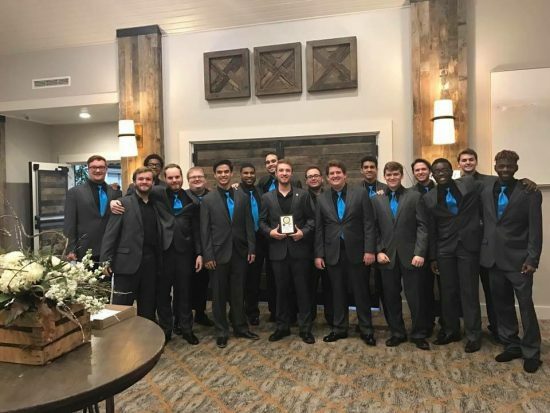 The Southern Gentlemen were named Champions of the Collegiate Challenger with a Superior rating at the inaugural Collegiate Challenge. The Southern Gentlemen sang two arrangements, one of which was a cappella, en route to winning the competition. “Afterwards, we got to meet and sing with the other ensembles. It was a great weekend of music making that we will not soon forget,” said student director Colin Harrison. The Collegiate Challenge was held by the Carolinas District of the Barbershop Harmony Society. A selection of four ensembles (Clemson University, Methodist University, Catawba Valley Community College, and Georgia Southern University) from entries spreading across the Carolinas and Coastal Empire were selected to compete in Asheville, N.C. The Southern Gentlemen were supervised by Department of Music Associate Professor Shannon Jeffreys, D.M.A.